1. Constitutional justice in the Americas at the turn of the Millennium; 2. Judicial power and the design of constitutional justice; 3. The political origins of powerful constitutional courts: constitutional governance and the politics of judicial design; 4. Identifying the political origins of constitutional justice through quantitative analysis; 5. Guatemala (1985): building constitutional justice in the shadow of Civil War; 6. Argentina (1994): negotiating a plural space of constitutional justice; 7. Bolivia (2009): governance logic in the new constitutionalism; 8. Conclusion: the politics of constitutional justice; Appendix A. Judicial power: concepts and measures. 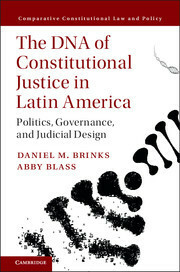 Daniel M. Brinks is Associate Professor in the Government Department and Law School at the University of Texas at Austin. He is also a Senior Researcher with the Christian Michelsen Institute. Abby Blass is a Ph.D. candidate in Government at the University of Texas at Austin.